If your child has been diagnosed with ADD, ADHD, sensory processing disorder, autism, or any other developmental delay or challenge, you or your child’s teacher may be on the hunt for classroom-appropriate sensory break activities you can include in his or her IEP, and we’re sharing 21 simple ideas you can start using TODAY to help restore a sense of calm to help your little one focus and learn. Also know as a ‘brain break’, sensory breaks are designed to provide calming or active input to help a child concentrate. Whether your little one gets distracted easily, appears hyperactive, or struggles with impulse control, or appears tired, disinterested, or lost in his or her own world, engaging in regular sensory break activities throughout the day will help him or her gain the sensory input needed to stay alert and focused both in the classroom and at home. What are the benefits of brain breaks for kids? How often should children engage in sensory break activities? For younger kids, sensory break activities should occur more frequently than is realistic in a classroom setting, but based on the literature I’ve read online, a good rule of thumb seems to be every 1-2 hours. Another great option is to set-up a sensory station in the classroom where kids can go if they are having trouble concentrating in between movement breaks. This may require a little prompting from teachers at first, but over time kids can learn to recognize when their attention is fading so they can proactively seek the sensory input they need to boost their energy. 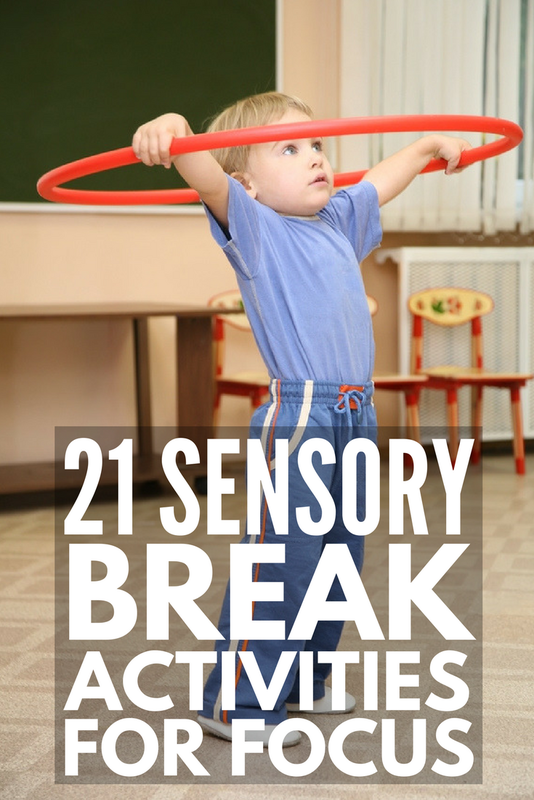 While there’s no denying regular movement breaks can have positive impacts on kids and adults alike, finding classroom-appropriate sensory break activities can be challenging. In a classroom filled with desks and chairs, it’s not practical (or safe) to engage the entire classroom in elaborate activities that require a lot of room. Here are 11 fun ideas that work well in small spaces! Animal Walks. Write a bunch of different animals on different pieces of paper, throw them into a hat, have each student choose one, and then have him or her walk across the classroom while pretending to walk like the chosen animal and see how long it takes the rest of the students to figure out what the animal is. Bounce on an exercise ball. Dance! Turn on some tunes and ask the whole class to get up and get their wiggles out. Planks. While boring on its own, engaging in a contest to see who can hold a plank the longest can make this core strengthening exercise a little more exciting! Jumping jacks. Set a timer and see who can do the most jumping jacks without stopping. Wall squats. Have each student stand with their backs against the wall with their feet a foot or so in front of them, and have them slowly slide down the wall so they’re ‘sitting’ without a chair beneath their bums. See who can hold the position the longest! Leg lifts. Leg lifts are a great classroom exercise for restless kids! Have each child stand sideways behind a chair and, using the chair for support, have them lift their legs up with their knees at a 90-degree angle. Try varying the length of time it takes her to raise and lower their legs (5 counts up, 5 counts down), and then see if they can balance for a count of 10 without holding onto the chair. Simon Says. Kids love this game, and you can make it extra motivating by choosing different students to be ‘Simon’ each day as a reward for good behavior, helping around the classroom, completing school work, etc. Listening to music. Create a calming playlist and an upbeat playlist on an inexpensive MP3 player, connect a pair of volume-limiting headphones to the player, and allow your students to take a 5-minute time out to listen to the music of their choice when needed. Spontaneous recess! On days when your classroom is extra rowdy (i.e. Friday afternoons, the day before a big holiday, etc. ), surprise them with an extra recess, walk around the neighborhood, or other outdoor activity to get them away from their desks. Brain breaks for kids aren’t just beneficial in the classroom. They can also help at home when kids are struggling to concentrate on homework and school projects, or when bad weather or illnesses force them to spend large blocks of time cooped up indoors. These sensory break activities require a bit more space, and most can be enjoyed by the whole family! Chi Flow & Phreeze Yoga Game Card Deck. It’s a combination of yoga and Twister, and your kids will love it! Fun with pillows. You can create a lot of sensory break activities with pillows! If you have a couch with big pillows, set them up on the floor and ask your child to turn them over as many times in a row as she can. You can also have her drag them from one end of your living room to the next and place a couple of toys on top along the way to see how long she can go without dropping them! Don’t have large couch pillows? No problem! Grab a couple from your bed and have your child walk up and down the stairs while holding the pillows in her arms. Square scooters. Square scooters aren’t just fun – they also help create a ton of different core exercises for kids, which double as great sensory break activities! For example, you can have your child lay with her tummy on the scooter, and then ask her to navigate around your living room using only her feet while she picks up various objects off the ground with her hands. Another idea is to have her sit cross-legged on the scooter and then move herself around the room using a broom while singing, ‘Row Row Row Your Boat’! Have a hula hooping competition! Leg kicks with an exercise ball. Have your child lie on her back with her hands at her side and her knees tucked into her chest. On the count of three, gently throw an exercise ball toward her, and have her straighten her legs in front of her so she can kick the ball back to you with her feet. It’s challenging to get the hang of, but it can be lots of fun! DIY crash mat. Getting your child to walk across a crash mat can be a lot of fun, and it’s easy to make your own one at home. All you need to do is place a bunch of pillows on the floor and throw a few blankets overtop. BOOM! It’s that easy. Play around with the height and number of pillows to make it more challenging! Ball exercises. An exercise ball offers countless sensory break activities for kids! Ask your child to lie on her tummy on the ball and sort objects from one container to another, have her sit on the ball and then lie backwards and reach her arms above her head so she can retrieve objects off of the floor, see how many times she can crawl over the ball, ask her to give you a ‘massage’ by lying on the floor while she rolls the ball up and down your back, get her to push the ball up a flight of stairs…the possibilities really are endless! Balloon Tennis. Grab a couple of fly swatters and blow up some balloons and then check out this fun balloon tennis activity over on Little Bins for Little Hands! Tightrope Walking. All you need is a bit of masking tape and a little imagination, and you can make all kinds of tightrope obstacle courses using your child’s favorite toys. A simple example is to have her walk from one end of the room to another with an object in each of her hands, and then have her stand on a step stool at the end of the ‘tightrope’ and bend over to place each object into a bucket. Simple, easy, and effective! Fun at the park. If your little one struggles to concentrate, visiting your local park before and/or after school can help shed some energy to help with concentration at school and while doing homework. Whether you’re the teacher or parent of a child with ADD, ADHD, sensory processing disorder, autism, or another developmental delay or challenge, these sensory break activities for kids are designed to provide children the sensory stimuli their bodies need so they can focus and learn. Perfect for use at school or at home, these movement break ideas are also great for improving gross motor skills, emotional regulation, and overall behavior while also encouraging cooperation and inclusion within the classroom. If you liked this collection of sensory break activities for kids, please share this post on Pinterest! And if you’re looking for more ways to help children with developmental delays, please follow our Autism and Sensory Processing Disorder board where we share all kinds of great ideas we find each day!